Times are tough for America’s “color revolution” industry. Perfected in Eastern Europe after the fall of the Soviet Union, and honed during the so-called “Arab Spring,” the process of backing subversion in a targeted country and overthrowing a sitting government under the cover of staged mass protests appears to be finally at the end of running its course. That is because the United States can no longer hide the fact that it is behind these protests and often, even hide their role in the armed elements that are brought in covertly to give targeted governments their final push out the door. Nations have learned to identify, expose, and resist this tactic, and like Adolf Hitler and the Nazi regime’s tactic of Blitzkrieg or “lighting war,” once appropriate countermeasures are found, the effectiveness of lighting fast, overwhelming force be it military or political, is rendered impotent. This was most recently observed in Armenia during the so-called “Electric Yerevan” protests – Yerevan being the capital of Armenia, and “electric” in reference to the alleged motivation of protesters – rising electric prices. American-backed “color revolutions” always start out with a seemingly legitimate motivation, but soon quickly become political in nature, sidestepping many of the legitimate, practical demands first made, and focusing almost entirely on “regime change.” For the Armenian agitators leading the “Electric Yerevan,” they didn’t even make it that far and spent most of their initial momentum attempting to convince the world they were not just another US-backed mob. Nikol Pashinyan and his “Civic Contract” party are transparently US-backed. So many found it suspicious that he was the most prominent voice insisting that the “Electric Yerevan” was not political and by no means a US-backed movement. “Even if you look at the ongoing processes through the microscope, you cannot see any foreign political or domestic political components in the demonstrations. People do not want electricity to grow in price. That’s all,” said Pashinyan. He said electric power is first of all a product: the Electric Networks sells it and the citizens buy it. “The protest actions should be considered as protection of consumers’ rights. Politics is nowhere near,” he said. The appeal to create a human wall was made by opposition lawmaker Nikol Pashinyan late on Tuesday as he urged all former and current MPs, scholars, show-biz representatives, lawyers, reporters, religious representatives and other public figures to visit the standoff site in order to ensure no force is applied against the protesters. Despite these links, some have attempted to claim Pashinyan was merely an opportunist and that his US-backing, and attempts by US NGOs to manipulate the protests had little to do with the protests themselves. But nothing could be further from the truth. America’s next generation of “color revolutions” attempt to obfuscate all possible ties between themselves and their agitators in an attempt to take back the strategic initiative by maintaining maximum plausible deniability. But if one knows where to look, they will find that no amount of obfuscation and subterfuge can cover the links between the US State Department and its mobs. 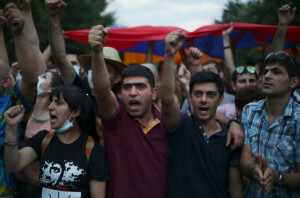 The protests were the work of the “No To Plunder” group, led by lawyers and activists emanating from the US State Department National Endowment for Democracy (NED), USAID, and Open Society-funded Armenian Young Lawyers Association (AYLA) and the Helsinki Citizens’ Assembly Vanadzor Office who openly coordinated efforts with “No To Plunder” to pressure the government on a number of issues. At least 2 members of AYLA, Ara Gharagyozyan and Arthur Kocharyan, were identified as core members of “No To Plunder.” AYLA’s news website “Iravaban” would list a number of young lawyers and activists attending one of its internship programs in 2014. Iravaban would also cover the protests in intricate detail from start to end, as well as report on activities AYLA and the Helsinki Citizens’ Assembly Vanadzor Office undertook to support the protests. A number of other pro-protest “news sites” included Hetq, which while it admits it is funded by convicted financial criminal George Soros’ Open Society Foundation, does not list the US NED as a sponsor – NED however does list Hetq. There is also Media.am, funded by USAID as well as the European Endowment for Democracy. All of this adds up to a large network of locally-based but foreign funded and directed media outlets that help add the illusion of consensus to disinformation spread regarding the protests. Together with US-funded training programs indoctrinating students and training lawyers and activists in the finer arts of sedition, then allowing them to go off on their own to lead mobs, the US believes sufficient plausible deniability has been created to hide ties between themselves and protest leaders. Similar efforts have been made in both Hong Kong and more recently in Thailand, where overtly US-backed mobs have been replaced by students trained, then unleashed by US-proxies. 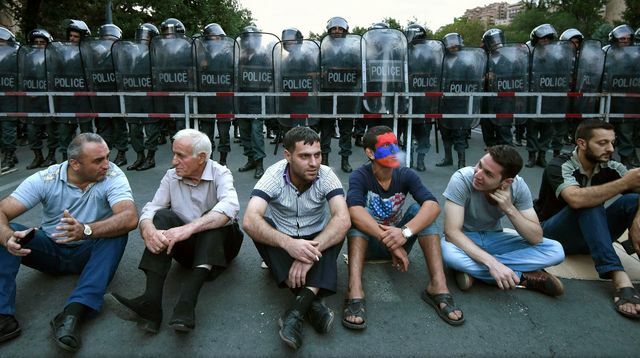 Despite this careful arrangement, the “Electric Yerevan” protests never reached critical mass. The reason for this is simple – they were suspected of being US-backed and the more overt US assets that would eventually need to move in to lead the protests were unable to, lest they confirmed that suspicion and undermined the entire effort. Without these more mainstream assets moving in and providing support, larger protests are logistically and politically impossible. Russia’s emerging media influence on the world stage played an essential role in unmasking and disrupting America’s efforts to destabilize and overthrow the government in Armenia. The ability to be one step ahead of the Western-narrative and expose the players before they even take to the stage, meant that people already knew what to look for. When the protesters hit the streets, and as the protests dragged on, US NGOs and Western media reports supporting the protests confirmed initial Russian warnings. When clumsy, overt assets like Pashinyan began getting involved, there was little doubt that electrical prices, while a real point of contention, were being used as a means to create a larger, more disruptive, and ultimately dangerous attempt at foreign-backed regime change. In the future, the government of Armenia should be careful about giving such points of contention for foreign interests to use in the first place – meaning that dedication to economic and social progress cannot be ignored, even if one is confident they can tamp down potential protests. Other nations around the world have a lot to learn from how Russia disrupted this latest attempt by America to project power beyond its shores and disrupt the lives of a sovereign people thousands of miles away. By simply informing people of what is really going on, following the money, and exposing the players involved, people in Armenia were able to assess for themselves whether or not to support the mobs – they chose wisely not to. Were Armenia to adopt similar laws as Russia’s regarding NGOs – mandating that they declare openly and often their foreign funding – people can better assess whether or not mobs these NGOs are supporting are truly marching for their interests, or Wall Street and Washington’s. Tony Cartalucci, Bangkok-based geopolitical researcher and writer, especially for the online magazine“New Eastern Outlook”. Republishing of the articles is welcomed with reference to NEO. The views of the authors do not necessarily coincide with the opinion of the editorial board.